Home » Blog » Frugal Living » New Pinecone Research Openings! I admit it! I LOVE Pinecone! The surveys only take 15-20 minutes! And they pay in points which equal about $3 each! Easy money, and they’ll deposit it right into your paypal account or mail you a check!! I’ve been part of the Pinecone for 3 years, and they are totally legit. I get 1-2 surveys a week, so for less than an hour a week I make from $12-$24 a month. It’s great! It keeps me in coffee (when I’m not pregnant) and coupons! 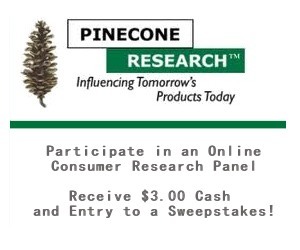 PineCone Research conducts on-line interviews with consumers from all walks of life to obtain their opinions about new products. To become a panel member, all you need to do is complete the simple form. This will only take a few minutes of your time. It’s easy and fun to see and evaluate new product ideas in the comfort of your own home! They’ve sent me a few different items to test and review. It’s always fun, and since you are honestly answering the questions, they are totally relevant to your life! Registrants who complete the signup form online and align with the recruit target(s) and are eligible for membership consideration will immediately receive an email invitation containing a link, ID and password to complete the full registration process. The link takes them to a brief “staging” survey (6 minutes or less) to gather some further information about that registrant and their household, and to gain agreement to the terms and conditions for panel membership. Join Pinecone Research and start making Money Now! Find more great Survey Companies! this would be great, except, no opening! I agree! I did Pinecone Research for a couple of years when I was just out of grad school and it was great! I stopped after a while but am keeping my fingers crossed that I can get back in. Thanks so much for posting this! I’ve been hoping to get back involved with them for a while now. I guess I missed it. I just keep getting rerouted to a page on your website that says offer expired. Bummer!